Complete catalogue of ecclesiastical Laces by the meter / yard, Embroideries and Crochets fabrics, beautiful threadwork designs embroidered by hand, economic Laces and Edgings sold by the metre / yard. 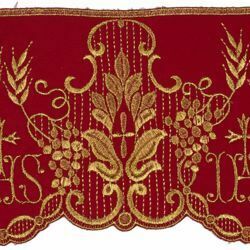 These fabrics are made of macramé, tulle or point filet and purl and are ideal appliques for Albs, Tunics, Cassocks, Surplices, Copes, Altar Linens, Altar Clothes, Curtains, Doilies, Banners, Canopies, Sunshades and Liturgical vestments. 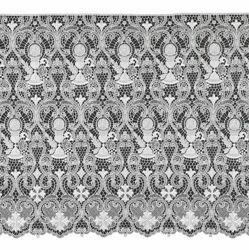 These lace patterns are made of prime materials such as Cotton, Polyester, Viscose, manufactured by the best italian ecclesiastical tailoring workshops, with unique floral and geometric designs, handmade crosses, liturgical icons and symbols. 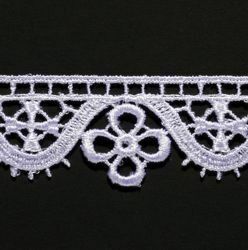 Laces edgings, fabrics and crochets are available in the liturgical colors Ivory, White, Red, Violet, Green, Gold. Quality 100% Made in Italy. 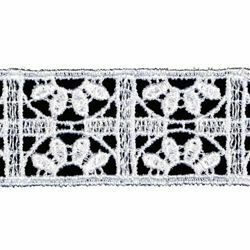 Liturgical Lace Floral Edging Lacework Viscose and Polyester for Albs, Surplices, Liturgical Clothing, Apparel and Vestments, etc. 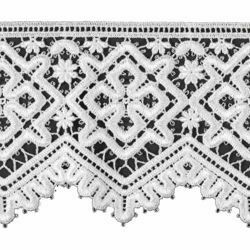 Liturgical lace embroidered and finished by hand, produced by an historical italian ecclesiastical tailoring workshop. Top quality Lace - Made in Italy. Produced in 13-meter (42,6 ft) cuts: for example, if you order 16 meters you will receive a 13 m piece + a 3 m piece. Price per meter (3,3 ft). 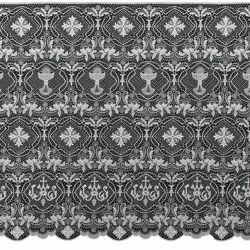 Liturgical Lace Edging Lacework Viscose and Polyester for Albs, Surplices, Altar Linens, Cloths, Liturgical Vestments, etc. 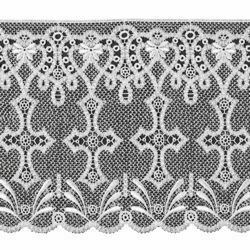 Liturgical Lace Edging Lacework con Croci Viscose and Polyester for Albs, Surplices, Liturgical Clothing, Apparel and Vestments, etc. 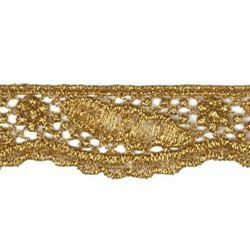 Liturgical Lace Edging Lacework Viscose and Polyester for Altar Linens, Cloths, Procession Canopies and Banners, Frontals, Liturgical Vestments, etc. 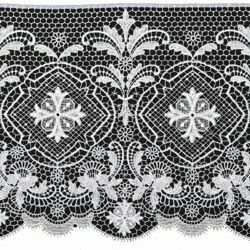 Liturgical Lace Edging Lacework Viscose and Polyester for Altar Linens, Cloths, Procession Canopies and Banners, umbrellas (Ombrellino), Liturgical Vestments, etc. 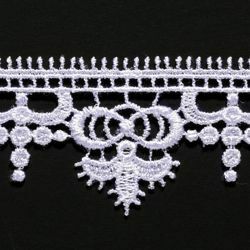 Liturgical Lace Edging Lacework Arc and Tips Viscose and Polyester for Altar Linens, Cloths, Liturgical Vestments, etc. 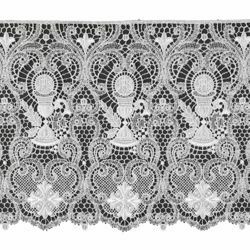 Liturgical Lace Edging Lacework Chalice Viscose and Polyester for Albs, Surplices, Altar Linens, Cloths, Liturgical Vestments, etc. 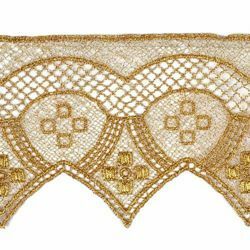 Liturgical Lace Edging Lacework Chalice Viscose and Polyester for Albs, Surplices, Liturgical Clothing, Apparel and Vestments, etc. 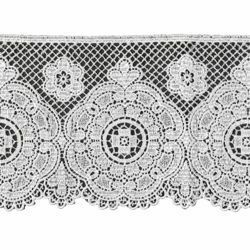 Floral Liturgical Lace Edging Lacework Viscose and Polyester for Altar Linens, Cloths, Liturgical Vestments, etc. 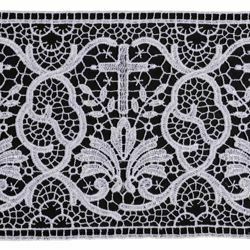 Liturgical Lace Edging Lacework Viscose and Polyester for Altar Linens, Cloths, Liturgical Clothing, Apparel and Vestments, etc. 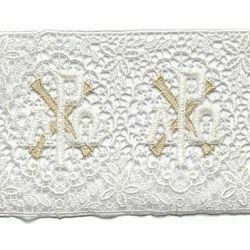 Liturgical Lace Edging Lacework Cross Viscose and Polyester for Albs, Surplices, Altar Linens, Cloths, Liturgical Vestments, etc. 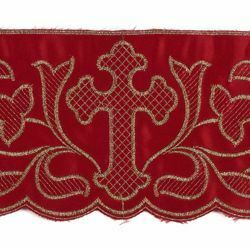 Liturgical Lace Edging Lacework Cross Viscose and Polyester for Altar Linens, Cloths, Liturgical Clothing, Apparel and Vestments, etc. 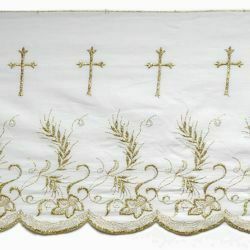 Liturgical Lace Edging Lacework Cross and Palm Tree Viscose and Polyester for Albs, Surplices, Liturgical Clothing, Apparel and Vestments, etc. 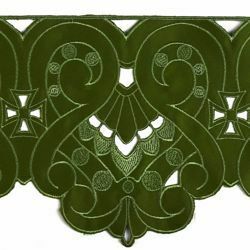 Liturgical Lace Edging Lacework Leaf Viscose and Polyester for Altar Linens, Cloths, Procession Canopies and Banners, umbrellas (Ombrellino), Liturgical Vestments, etc. 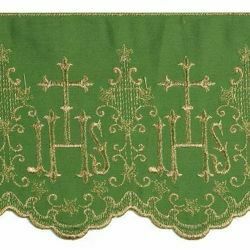 Liturgical Lace Edging Lacework Leaf Viscose and Polyester for Altar Linens, Cloths, Liturgical Clothing, Apparel and Vestments, etc. Liturgical Lace Edging Lacework Rosette Viscose and Polyester for Albs, Surplices, Altar Linens, Cloths, Liturgical Vestments, etc. 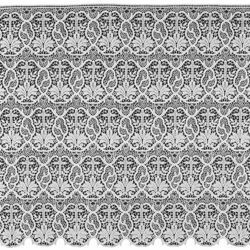 Liturgical Lace Edging Lacework Cross Rhomb Viscose and Polyester for Altar Linens, Cloths, Liturgical Vestments, etc. 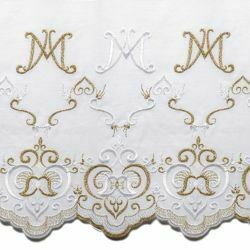 Liturgical Lace Edging Lacework Marian embroidery Viscose and Polyester for Albs, Surplices, Liturgical Clothing, Apparel and Vestments, etc. 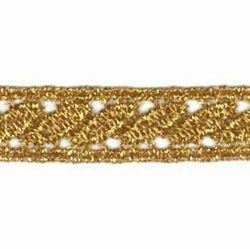 Liturgical Lace Edging Lacework Marian embroidery Pure Cotton for Altar Linens, Cloths, Procession Canopies and Banners, Frontals, Liturgical Vestments, etc. 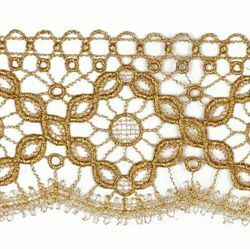 Liturgical Lace Edging Lacework Eears of Corn and Grapes Pure Cotton for Altar Linens, Cloths, Procession Canopies and Banners, Frontals, Liturgical Vestments, etc. 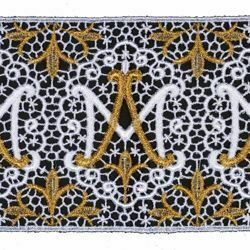 Embroidered Quatrefoil Liturgical Lace Edging Lacework Viscose and Polyester for Altar Linens, Cloths, Procession Canopies and Banners, umbrellas (Ombrellino), Liturgical Vestments, etc. 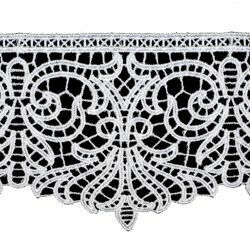 Liturgical Lace Edging Lacework Cross Pure Polyester for Altar Linens, Cloths, Procession Canopies and Banners, umbrellas (Ombrellino), Liturgical Vestments, etc. 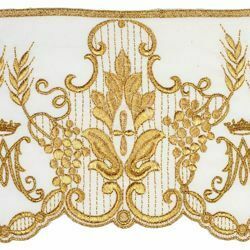 Liturgical Lace Edging Lacework Marian embroidery Pure Polyester for Altar Linens, Cloths, Procession Canopies and Banners, umbrellas (Ombrellino), Liturgical Vestments, etc. 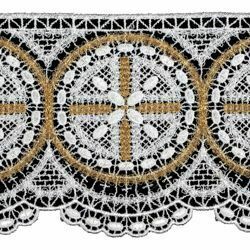 Liturgical Lace Edging Lacework JHS symbol Pure Polyester for Altar Linens, Cloths, Procession Canopies and Banners, umbrellas (Ombrellino), Liturgical Vestments, etc. 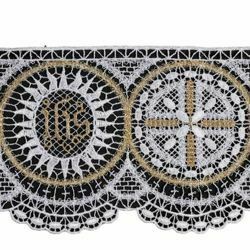 Liturgical Lace Edging Lacework JHS symbol Pure Cotton for Altar Linens, Cloths, Procession Canopies and Banners, Frontals, Liturgical Vestments, etc. 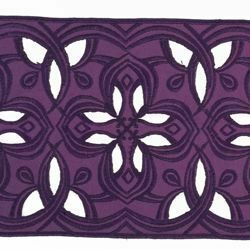 Liturgical Lace Edging Lacework Rosette Viscose and Polyester for Altar Linens, Cloths, Liturgical Vestments, etc. 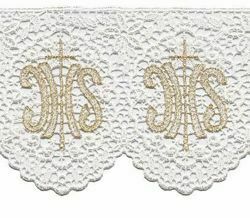 Liturgical Lace Edging Lacework JHS symbol Viscose and Polyester for Altar Linens, Cloths, Liturgical Vestments, etc.